PHILIPPINES (June 8, 2018) – After an amazing night of performances by a diverse group of acts with unbelievable talent, Lost Voice Guy was crowned the winner of 2018 Britain’s Got Talent! 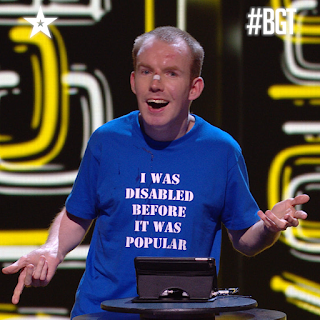 Lost Voice Guy, also known as Lee Ridley, is the first comedian to ever win Britain’s Got Talent in 12 seasons. The 37-year-old, who has cerebral palsy, uses a voice synthesizer for his acts - but that didn’t stop him from winning £250,000 in prize money and the opportunity to perform at the Royal Variety Performance. Lost Voice Guy’s self-deprecating humor won the public over in the grand finale with fellow musician comedian Robert White in second place and singer Donchez Dacres in third place. “You so deserve this. I’m so happy,” Simon Cowell said. Relive Lost Voice Guy’s winning moment on Britain’s Got Talent by catching the encore this Sunday, 10 June at 8.05pm on AXN.